In last decade, index funds have gained lot of popularity. What makes index funds attractive is their low cost. Compared to actively managed funds, index funds has lower expense ratio. ‘HDFC Index Fund – Sensex’ is one of the better index funds. It has an expense ratio of 0.3% (Regular Plan), and 0.1% (Direct Plan). ‘Invesco India Multicap Fund’ is one of the better performing multicap funds. It has an expense ratio of 2.46% (Regular Plan), and 0.95% (Direct Plan). So if we compare the expense ratio of multicap funds and index funds, the latter is a clear winner. Multi cap funds are very expensive compared to index funds. So which is better – index funds or actively managed funds like multicap funds? A common man like me and you should pick which type of mutual fund? To answer the above question, I decided to collect some data related to mutual funds. Last 10 Years Average Returns. Last 5 Years Average Returns. Last 3 Years Average Returns. Price Volatility (Last 3 Years). What is the source of data? I have collected the data from morningstar. I have screened those mutual funds which had at least 10 years past data available for analysis. Number of mutual funds I have considered for my analysis is as listed below (total: 271 Nos). Large Cap Funds – 64 Nos. Mid Cap Funds – 57 Nos. Small Cap Funds – 23 Nos. Multi Cap Funds – 73 Nos. Value Funds – 28 Nos. Index Funds – 26 Nos. Before analysing the data, let me highlight a number in the above table which plays a part in the decider between index funds vs actively managed funds. 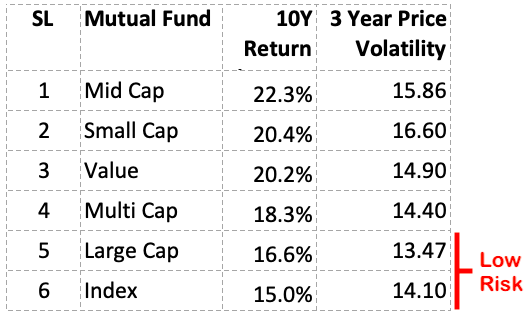 In the period of last 3 years, which type of mutual fund was least volatile? From these values it is clear that index funds (and large cap funds) are least volatile funds. 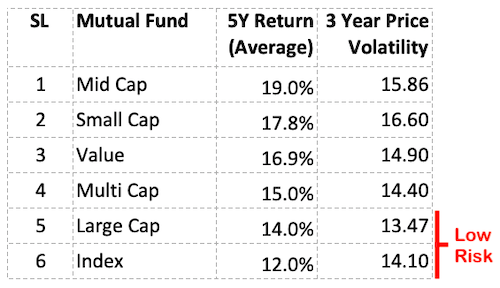 Small cap fund is the most volatile mutual fund. Hence one distinction between index funds vs actively managed funds is already clear. 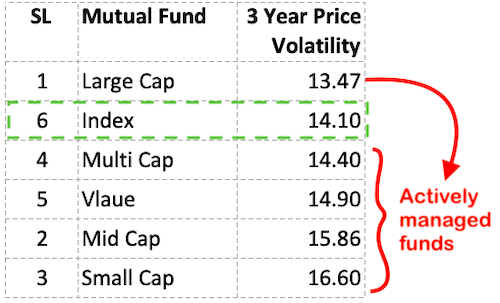 Except for the large cap fund, 3 year price volatility of index funds is least compared to other actively managed mutual funds. I personally consider the time horizon of 3 years as “small” for equity investors. With my personal experience, I can say that 3 year period is rather a small holding time. What is evident from the numbers in the above table is an important point. This point will make more impact when we will discuss returns of longer time horizons (like 5 & 10 years). What is the point? For equity investors who are not investing for a longer terms, index fund is giving good returns. Holding Time: People will generally buy mutual funds and hold it for only next 3 years or less. Price Volatility: Within a shorter time horizons like 3 years, price fluctuations of index funds will be lower than actively managed funds. Returns: When holding time is as short as 3 years, index funds tend to give better returns than actively managed funds. Expense Ratio: Expense ratio of index funds are anyways low. If people can pick a direct plan, return of index funds (in a 3 year period) will be even better. How many mutual funds are there in my portfolio which I’m holding since last 5 years? If I’m not mistaken, 80% people will give ‘Nil’ as an answer. The point is, we common people do not stay invested in equity for this long. Either we stop contributing to the fund and switch, or we simply sell the units and use the money somewhere else. This is a very strong consideration when expert suggest index funds as a better investment option for we common people. They know that we will not stay invested for more than 3 years at a stretch in a mutual fund. Now suppose, you are not in the general 80% category. You are the one who will stay invested for 5 years. What is clear from the above numbers is that, low volatile/low-risk funds like index and large cap mutual funds are giving low returns. The top 2 funds in terms of returns are those funds which were considered most volatile (when investment time horizon was 3 years or less). But now (in 5 years periods), these funds are giving the best returns. Fund Selection: We will start picking mid cap funds instead of safer index funds. Difference in Returns: We may start earning higher returns. There is a difference of 7% between returns generated by index funds compared to actively managed funds (19% – 12%). There are hardly any people who stay invested in equity for a period as long as 10+ years. My personal guess is, out of 1,000 people investing in mutual funds, only one or two will hold on to their units for this long. Yes, this holding time is so rare. But people who follow such holding periods also gets compensated accordingly. Consider this, we common people who hardly stay invested for more than 3 years, what best returns we can earn? 14.7% from index funds. But people who will stay glued to their actively managed mutual fund for 10 years or more, can earn a return as high as 20%+. What is clear from the above numbers is this, low risk funds like large cap and index funds are giving minimum returns. The high risk funds like mid cap and small cap funds are giving returns in tune of 20-22% per annum. The difference in returns between an index fund and a mid cap fund is close to 7.3% p.a. Index funds can give a returns like 15% p.a. in 10 years. 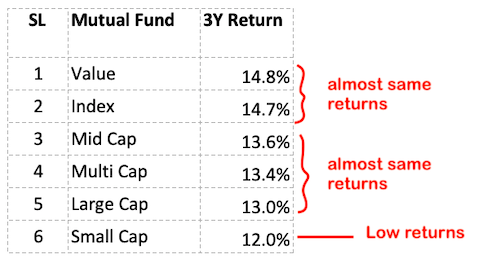 An actively managed fund (like mid cap fund) can give a returns of 22.3% in 10 years. What is the difference between 15% and 22.3%? Suppose you are investing Rs.25,000 per month in a mid cap fund for next 10 years (@22.3% p.a.). You will build a corpus of Rs.1.1 Crore. Investing Rs.25,000 per month in an index fund for next 10 years (@15% p.a.) – will build a corpus of Rs.70 Lakhs. Because of the 7% difference in returns, the difference in corpus built will be Rs.40 Lakhs (1.1 Crore minus 70 lakhs). Expert and skilful ‘mutual fund manager’ can beat the index. But in order to do so, we must give ‘ample time’ to our fund manager. What I mean by ‘ample time’? We must stay invested and hold the mutual fund units for periods like 5-10 years. In our debate between index funds vs actively managed funds, the clear winner is actively managed funds. Actively managed funds can give higher returns than index funds, but for that one must stay invested for long term. But we people do not stay invested for so long. Generally speaking, our holding time is three years or less. For such smaller time horizons, index fund is a better investment vehicle. How to invest Rs.5,000/month in mutual funds. Type of mutual funds in India. Performance of mutual funds and Total Return Index (TRI). Use capture ratio to pick good mutual funds. Use sharpe ratio to buy best mutual funds. Are Debt Funds Good for small investors?